First thing we should know about Kosovo is that the Europe’s youngest country has also the highest population growth rate on the continent, so the families with five or more children are quite common. Secondly, amongst its population it is a quite common practice for young people to get their education and search for their luck abroad, usually in Western Europe and America. Third thing, Kosovo is a place where modernity collides with family values-oriented (patriarchal) tradition, creating a unique amalgam. Karahoda’s film gets all of them telling the story about fathers building exactly the same (or at least very similar) houses for their sons – three, five or even more, always on adjacent plots of land. All of them remain empty for quite a while, since their potential inhabitants are usually absent, but it is a new tradition forged from old ones. The intention behind is to show family unity and equality, but, oddly enough, daughters do not get their share of inheritance – they get married and incorporated into the husbands’ families. 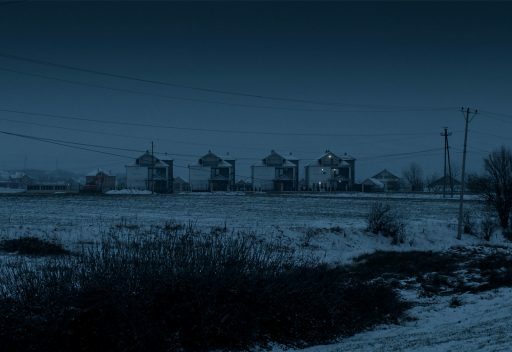 Thanks to the formal strictness of Karahoda’s cinematography, In Between looks astonishing, Enis Saraçi’s editing makes it fluid and the sound design by Memli Kelmendi is quite unique, making the sound scheme of neighbourhoods additional character in the film, together with (usually absent, but at crucial moments present) people and architectural landscape. The pure artistic quality elevates the film from the local level to a more universal one.